Yesterday Bjorn van der Horst shook my hand. Why? Because I was a customer, and that’s what he does; with everyone, it seems. Bjorn is a former chef of Gordon Ramsay’s old La Noisette restaurant and a former head chef of The Greenhouse in Mayfair. He’s now (with his wife) in charge of Clerkenwell’s Eastside Inn and is one of those ‘Ones To Watch’ thingies (he’s recently been seen on Saturday Kitchen). I was at Eastside Inn to (a) luncheon with his lovely PR lady, and (b) check out the Homage de Wimbledon dessert (more on that in a moment). Having never before been to Eastside (I’m dropping the ‘Inn’ - it seems superfluous and unnecessary to me), I wasn’t aware of the theatrical set up whereby all the culinary action happens right in the centre of the room, in a fully open kitchen, for all the world to see. Even those with their backs to the Bjorn can keep a beady eye on the progress of their spit-roast lobster with bone marrow thanks to the large, wall-hugging mirrors. Having had breakfast at LAnima with our Becs (see blog post below), I skipped the starter and went straight to the main (by way of a refreshing glass of prosecco): the pork belly and artichoke salad washed down with a fairly pungent (see: yum!) Picpoul de Pinet. Despite a few minor crackling cutting issues, I was easily impressed. And then onto the main event: the Homage de Wimbledon. Strawberries and cream (naturally) temporarily housed in a spherical white chocolate and coconut tennis ball, laying on a ‘court’ of green coconut shavings. Only, the one I was given wasn’t yellow and looked more like an Homage de Footie Coupe du Monde. The drama came with the introduction of hot strawberry sauce to the whole affair when the structure delightfully caved in. Again, theatre was the key element (and reminded me of a trick Jordi Villa used at a chef’s table event Fluid went to recently at Vivat Bacchus). 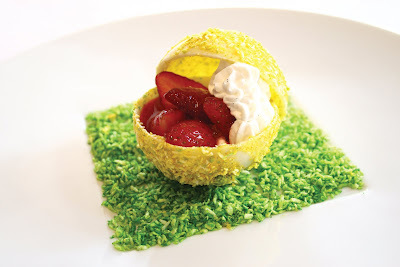 The dessert was a little sweet for my liking but I can understand why it will be popular during Wimbledon season. That dessert looks awesome... I definitely could have eaten that after all the bread!